The Scottish National Party was down 15 points in the polls to Labour in February when Kirk Torrance approached me about using the still-in-alpha NationBuilder to power a new snp.org website and their plans for a social media fueled campaign. It was up and running in a couple weeks. 2 months later they beat Labour by 32 seats, securing a majority of the Scottish parliament. We try to stay out of the politics here at NationBuilder because our tools are about enabling democracy regardless of your political beliefs. We believe there is a new way of campaigning and the SNP's new media team (Kirk Torrance, Ewan McIntosh and Stephen Noon) absolutely nailed it. They achieved something historic, and we are thrilled to have played a small part in it. The SNP was founded 70 years ago to be the national party of Scotland, and on Thursday that dream was realized. Congratulations. Read the article in today's Times for how they did it. Full text is after the jump. Kirk Torrance, the SNP’s new-media strategist, is standing over his PC, his constant companion for the past 18 months. Suddenly he points down the packed boardroom towards a giant television screen on the wall. “It’s coming now!” he shouts. The tickertape running at the bottom of the screen tells the story. After a recount, the SNP have won Kirkcaldy, the 65th seat that guarantees a majority in the Scottish Parliament. Before the television has even cut to the voice of the returning officer, the room is in uproar. Everyone is on his feet. Many, like Kevin Pringle, Alex Salmond’s special adviser, are staring at the screen, smiling, clapping their hands and shaking their heads in joy and disbelief. People are falling into each other’s arms, hugging and kissing. Nicola Sturgeon, the deputy leader, has cupped her face in her hands and is on the verge of tears. The impossible has happened. An electoral system that was purposedesigned to deny the SNP power has been overridden. 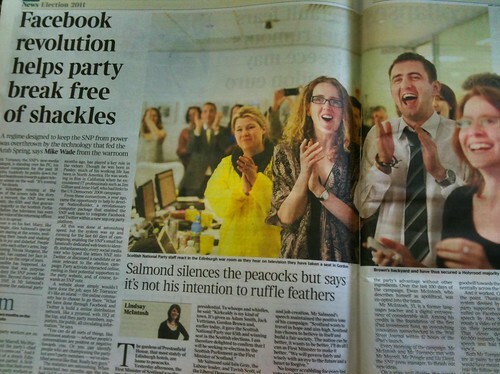 Beyond their wildest dreams, the SNP, in Mr Salmond’s words, has become the national party of Scotland. His party workers are on cloud nine. “Look,” says Peter Murrell, Ms Sturgeon’s husband and the party’s chief executive. “The sun’s come out.” And it is true. The clouds of a dreich Edinburgh afternoon have parted. A Scottish summer has begun that feels every bit as vibrant to these party workers as the Arab Spring felt in Egypt. It might seem absurd, but no one here would deny the comparison. The SNP’s strategy has harnessed digital media as never before, integrating activity on Twitter and Facebook with off-line, face-to-face work on the doorstep to stunning effect. Technology has moved on in leaps and bounds even in the three years since Barack Obama’s US presidential victory set the standard for online campaigning. Mr Torrance says that the SNP operation in 2011 will now be the model for political parties all over the world. Mr Torrance, who was appointed 18 months ago, has played a key role in the victory. Though he was born in Paisley, much of his working life has been in North America. He was working in film in California when he encountered IT professionals such as Jim Gilliam and Jesse Haff, who had links to the US Democrats’ 2008 campaign. From these connections, a year ago, came the opportunity to help to develop NationBuilder, a revolutionary computer package that enabled the SNP web team to integrate Facebook and Twitter within a new snp.org party platform. All this was done at astonishing speed, but the system was up and running for the last 60 days of campaigning, enabling the SNP’s small but fanatically dedicated web team to identify, instantaneously, every social media user who typed the letters SNP into Twitter, or discussed a candidate or an issue relevant to the election campaign. Party activists interacted online, reeling in their potential supporters to the party website, and, of course, towards an SNP vote. A website alone simply wouldn’t have done the job, says Mr Torrance: it’s like an island — the online community has to choose to go there. “What we have done through Facebook and Twitter is build a online distribution network, like a pyramid, with HQ at the top, and then party members, supporters, the public, all circulating information,” he says. The statistics are astonishing. When it launched two months ago the site had 13,031 users (almost equivalent to its party membership). It has grown to 35,879 users, signing in through social media accounts. In the past two months the SNP’s Facebook site has had 2.2 million hits. They also drew in new campaigning materials, photos and videos supplied by ordinary voters, and recirculated by SNP Studios to the delight of voters on the farthest flung Hebridean isle and have engaged directly with and influenced party HQ. None of this would have worked to the party’s advantage without other ingredients. Over the last 100 days of the campaign, Ewan McIntosh, who describes himself as apoliltical, was co-opted into the team. Mr McIntosh, 33, is a former languages teacher and a digital entrepreneur of considerable skill. Among his credits is the foundation of the first iPad investment fund, an eyecatching innovation namechecked in the Wall Street Journal within 12 hours of the iPad’s launch. Every morning of the campaign, Mr McIntosh and Mr Torrance met with Mr Murrell, Mr Pringle and Liz Lloyd, the SNP press manager, to thrash out new ideas. How good? Well the 39,000-word manifesto might be the kind of thing that political analysts like, he says, but it doesn’t connect with the public. Together with the press team, he created mini-manifestos, each one no more than 400 words, and carefully crafted to reach 14 different sectors of the electorate: carers, small businesses, students and so on. Then there was the matter of language and tone. The SNP’s mantra of “positivity” may have set their opponents’ teeth on edge, but in this online campaign it was absolutely fundamental. Online, party workers engaged tens of thousands of people in the sure knowledge that an upbeat, sensible, engaging tone would win friends, and goodwill towards the party spread exponentially across the internet. And it worked. One example makes the point. Thanks to an ingenious system devised by Mr Torrance, 50 party supporters instantaneously signalled on Facebook their “like” for a speech by Alex Salmond; simultaneously a video of the speech appeared on their personal Facebook pages. That clever device meant that 60,000 instantly became aware of the speech and had the opportunity to view it. Both Mr Torrance and Mr McIntosh are at pains to stress that their work would have meant nothing without the real-life follow-up of door-knocks, the daily grind of an election. But every one of those digital contacts had an offline follow-up. Here, in this room, the technological foundations of a stunning victory were laid. Ms Sturgeon, who has spent much of the past few hours sitting with her shoes off, is well heeled again, and stepping forward to make a speech. She leans forward, propping herself up on the desk as if still overwhelmed by what has unfolded before her. Behind her the BBC screens news, in silence, of council votes in Kent. “This operation in here is mind blowing,” she says, straightening herself up. “The effort you put in day in, day out, night in, night out has been way beyond the call of duty. Without the effort and contribution that all of you have made we wouldn’t be standing here today making history. Thank you all so much, Enjoy it. You are history makers." @KirstinGove tweeted link to this page. @DavidForbes tweeted link to this page. @RMLFVR tweeted link to this page. @adrielhampton tweeted link to this page. @cecook tweeted link to this page. @iPad__Mania__ tweeted link to this page. @oliverquinlan tweeted link to this page. @GordonWright tweeted link to this page. @duvien tweeted link to this page. @TheCornishRep tweeted link to this page. @josepicardo tweeted link to this page. @dominiccampbell tweeted link to this page. @leepeyton tweeted link to this page. @digitalmaverick tweeted link to this page. @DeputyMitchell tweeted link to this page. I'm reading about how @ewanmcintosh made a difference!! http://t.co/JpHevHZ <--- Well done Ewan!! @garethreynolds tweeted link to this page. @peterbjordan tweeted link to this page. @TheMainstand tweeted link to this page. @ewanmcintosh tweeted link to this page. @philippebossin tweeted link to this page. He down plays the effect the more experienced Nats had years before he was on the scene, adopting and debating on the Internet and forum building. You came into a half built house. Basically the software is a simile of software available for Joomla. But good on yous for catching up with us and developing a proper new media strategy. @gov20radio tweeted link to this page. @Una7mas tweeted link to this page. @ScotlandPR tweeted link to this page. @marcelobernard tweeted link to this page. @gmartin tweeted link to this page. @BundleOfStartup tweeted link to this page.